Lamar Odom made an appearance at a University of Rhode Island basketball game in 2013. Lamar Odom is best known as a former NBA star and member of the Kardashian family. But he also has local ties, having attended high school in Connecticut and college in Rhode Island. Odom, who is from Queens, New York, played basketball for one year (1998-99) at the University of Rhode Island before leaving to enter the NBA Draft. Prior to that, he briefly attended St. Thomas Aquinas High School in New Britain, Connecticut. Odom, 35, is said to be "fighting for his life" after he was found unconscious Tuesday at a Nevada brothel. In his time at URI, Odom averaged nearly 18 points a game and led the Rams to their first-ever Atlantic 10 title. His three-point shot at the buzzer against Temple won the 1999 A-10 championship, sending the team to the NCAA Tournament (watch it below at the 3:35 mark). Two years ago, Odom returned to campus, attending a URI basketball game. He was reportedly working with local trainer Rob McClanaghan as he attempted an NBA comeback. It was Odom's first return to town since he was drafted. His 1999 buzzer-beater against Temple was shown on the big board during the game. The University of Rhode Island issued a statement Wednesday saying "The University community is deeply saddened by the news about Lamar Odom. We wish for him a speedy recovery, and hope that he gets the help that he needs going forward." 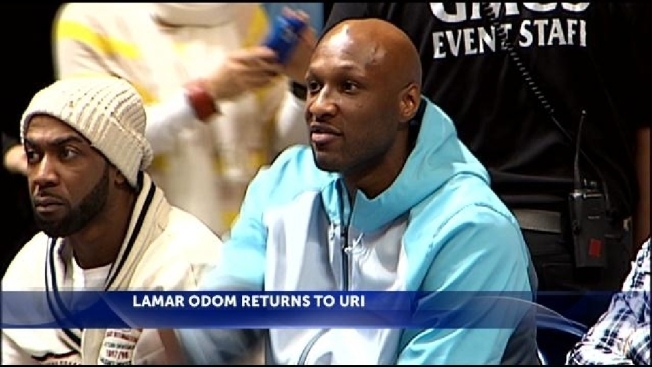 Even though it's been years since Odom was at URI, news of the famous alum's hospitalization quickly made its way across campus on Wednesday. "Everyone is talking about how they're sending their prayers out to him and everything and his family," said Josh Luzzi, a junior at URI. "I think he is a role model for a lot of people, and it's just unfortunate when someone that a lot of people look up to go through a tough time," added URI senior Kelsey Silva. Albie's Place Restaurant owner Jason Wichert said Odom frequented his deli when he was on campus. "I still got his rookie card, waiting for him to come back in," he said.